^ SSN-774 Virginia-class / NSSN New Attack Submarine / Centurion. FAS.org. 2000-10-15 [2016-01-12]. （原始内容存档于2015-11-01） （英语）. ^ Osborn, Kris. 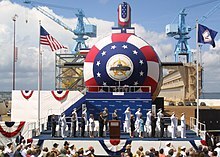 Navy Considers Future After Virginia-class Subs. Defensetech.org. 12 February 2014 [26 April 2015]. ^ PHOTONICS MAST (PMP) SYSTEM (PDF). [2010-11-16]. ^ Statement of The Honorable Duncan Hunter, Chairman, Subcommittee on Military Procurement, Submarine Force Structure and Modernization. FAS Military Analysis Network. Federation of American Scientists. June 27, 2000 [2008-03-01]. ^ The US Navy -- Fact File. [2007-07-05].